MIHIN LANKA'S seventh destination, Singapore is gaining in popularity and many business travellers too are patronising the airline. 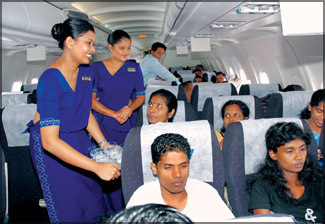 The service was introduced last month and operates thrice a week services between Colombo and Singapore. airline presence into Far East, Asia and the Middle-East sector. "This will give an excellent opportunity for travellers, holiday makers, and businessmen to take advantage of extremely competitive fares and excelled on-board service," he said. Mihin Lanka with its inception into Singapore is opening a new door of opportunity for people to travel, and by making use of the competitive fares to take more spending money with them to the destination rather than spend it all on the air fare. "This we are sure would enhance trade, investment and tourism between the two countries as well. Mihin Lanka is proud to be able to be a stakeholder in such synergies," he said. Mihin Lanka now flies to seven destinations, Trichy, Trivandrum, Bodhgaya, Bangkok, Maldives and Singapore. "This reflects a strong growth in a period of four months from the inception of the airline." Mihin Lanka flights leave Colombo International Airport at 0550 hours every Monday, Wednesday and Friday arriving in Singapore at 1250 hours. The return flight leaves Singapore at 1355 hours and arrives in Colombo at 1555 hours. The timing makes travellers use the maximum stay of their hotels for check in and checkouts. The increased baggage allowance too is another advantage for its passengers and business travellers. The traffic from Singapore to Colombo too are now picking up with many business travellers flying business class. Travel agents and local hotel operators are also hoping to market a special holiday package and also introduce special Buddhist tour packages for Singapore nationals. EMIRATES' reputation for being ahead of the times has taken on a new dimension after speeded up images of a passenger engrossed in the airline's pioneering in-flight entertainment system landed a top digital advertising award. In securing "Gold" in the Travel and Leisure Category at the Campaign Media Awards 2007 in London, the airline has again demonstrated its leadership and creativity on the web. Fierce competition in this category came from across the international business world, not just the airline industry, and Emirates beat off competition from corporate heavyweights such as google and lastminute.com to pick up the prized accolade. The winning creative was for the "Time Will Fly" promotion of Emirates' ice in-flight entertainment system. The rich media video adverts, linked through to the campaign microcyte, hosted on www.timewillfly.com. The site allowed surfers to explore the ice system and carried an amusing, speeded up video showing a passenger captivated by the 600 channels of films, games and audio, emphasising the fact that with so much content to choose from on board, time really does fly. The campaign ran from May 2006 to March this year across the United States, Middle East, UK and Australasia, and generated a staggering 33 million on-line 'impressions.' Response levels were between double and eight times greater than the industry average, depending on the region - a key factor in winning the award. Mike Simon, Emirates' Divisional Senior Vice President, Corporate Communications, said: "I doubt there has ever been a case where so many peoples' attention has been drawn to one passenger watching his in-flight television screen. 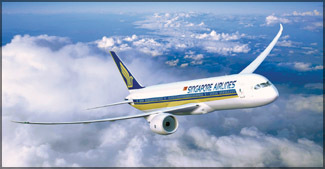 SINGAPORE Airlines has again secured the "World's Best International Route Airline Award" in the annual Readers' Choice Awards 2007 poll conducted by the US-based travel magazine, Conde Nast Traveler. The Airline has won this top award 19 times since the Award was launched 20 years ago. The magazine has a readership of over three million. In another annual survey conducted by the UK edition of Conde Nast Traveller, Singapore Airlines was rated the "Favorite Business Airline 2007" by Business Class travelers. Recently, readers of the UK-based Business Traveller magazine voted Singapore Airlines as the top airline in the following categories: Best long-haul Airline, Best Business Class, Best Cabin Staff and Best Asian Airline. These accolades come soon after the recently announced rating of Singapore Airlines as Airline of the Year in the annual Skytrax survey. Qatar Airways recently completed its fourth Japan Association of Travel Agents (JATA) World Travel Fair in Tokyo, Asia's largest travel trade show. The airline has become a regular at the expo that attracts over 100,000 travel industry professionals and consumers, since announcing the launch of flights to Japan in 2004. Capitalising on a bumper year filled with record aircraft orders, industry accolades and new route launches - including establishing services to North America - the airline has put together an exciting stand for the three-day exhibition aimed at promoting travel from Japan to destinations around the world through the airline's operational hub in Doha. The 72m2 exhibition space features a Qatar Airways' business-class seating which visitors can experience. Members of Qatar Airways award-winning cabin crew have flown into Tokyo to attend the show and meet and greet visitors to the airline's stand. A Greek opera singer will perform as part of a promotion of flights to Athens via Doha. Qatar Airways Senior Manager Far East Asia & Australasia Marwan Koleilat said Qatar Airways was proud to be a part of this exhibition, the most important travel trade show within the local Japanese market. "Shows like JATA are an ideal opportunity to let the local travel industry and the general travelling public know about the latest developments within the airline," said Koleilat. The show is held annually in conjunction with the JATA World Travel Congress at the Tokyo International Exhibition Centre, locally called Tokyo Big Sight. The venue is Japan's largest exhibition and convention centre. As protests dodge the organised retail industry in the country, in-flight retailing is picking up with no air pockets so far. As government mulls addition of more domestic carriers and expansion of the aviation sector, this nascent retail sector is set to touch new heights.